The University of Virginia offers a wildly popular course called “Dracula.” Coming out of the Department of Slavic Languages and Literatures, the course has appeared on student-generated lists of the top classes that ’Hoos should take before they graduate. Course Hero, an educational technology company, even named associate professor Stanley Stepanic, who teaches “Dracula,” a master educator. With Halloween nearly upon us, UVA Today caught up with Stepanic for a fun Facebook Live event. He discussed his course, his teaching style and why Dracula is important, and even offered some spooky Dracula movie suggestions. Over half of Stepanic’s course covers Slavic folklore. “Basically, the character Dracula is used as a vehicle to really understand human experience,” he said. We asked Stepanic to share the top 10 things people should know about “Dracula,” Bram Stoker’s famous 1897 Gothic horror novel. Here is his list. 1. Bram Stoker deleted about three chapters at the start of the novel to save space, streamline the story and reduce the cost of printing. The original notes Stoker left behind indicate he removed characters and a different structure, including a trip through a Munich “Dead House,” or morgue, and a paranormal researcher. 3. The Dracula character was inspired by several things, but in literature the most important is arguably “Carmilla,” the most important tale of a female vampire ever written. Stoker knew the author and worked for him as a drama critic. Stoker also took ideas from other works of vampire literature, including “The Mysterious Stranger.” This work has long been attributed to an anonymous author since it first appeared in English in 1854, but in actuality it was simply a translation of the German tale “Der Fremde” (“The Stranger”), first published in 1847 by Karl Adolf von Wachsmann. 4. The original title of the novel was not “Dracula,” but actually “The Un-Dead.” Stoker considered at least two other titles, “The Dead Un-Dead” and “Dracula or the Un-Dead.” He settled on “Dracula” roughly a week before publication. 5. Stoker’s character Count Dracula was not called Dracula at all originally. In Stoker’s notes, he indicated at one point simply “Count _____,” with a blank as written here, and then eventually began to use the uninspired name “Count Wampyr,” which he appears to have taken from the Serbian. 6. Count Dracula was not inspired by a real historical figure, Vlad the Impaler, as many people believe. Stoker came across Vlad III Dracula while researching a book about the region of Romania during a visit to Whitby, England. In the text of this book the name Dracula appears three times, and one of them is actually referencing another person. The history the character Count Dracula presents in the novel is actually a conglomeration of ideas Stoker pieced together, some plagiarized from earlier works. 7. Though Stoker is well-known today, he was not in his own day. He was a minor writer at best, and made almost nothing off “Dracula” – roughly a little more than $3,000, adjusting for inflation in 2018 dollars, hardly a salary one could live off of. That’s not surprising, considering writing was not even his primary job; he was foremost a theater manager. 8. The first foreign-language edition of “Dracula” was actually published in Icelandic in 1901, a curious choice. Even today, scholars aren’t certain of Stoker’s relationship to the translator, who used Stoker’s original preface which connected Dracula to Jack the Ripper, and even rewrote significant parts of the novel. It even has a different title: “The Powers of Darkness” would be the translation of it in English. In essence, it is a different book. 9. Stoker was primarily remembered for managing the Lyceum Theater in his day, and his biography about his employer, Henry Irving, was praised as his most important contribution to literature. This was his “Personal Reminisces of Henry Irving” (1906). 10. Were it not for the copyright battle against “Nosferatu,” a 1922 German film that bootlegged the plot of “Dracula,” Stoker’s novel may never have become famous. The legal attention brought by Florence Stoker, and the subsequent stage versions of “Dracula” that made it to film eventually, led it on the path to fame. It is largely adaptations of “Dracula” that made it famous, not the novel itself. 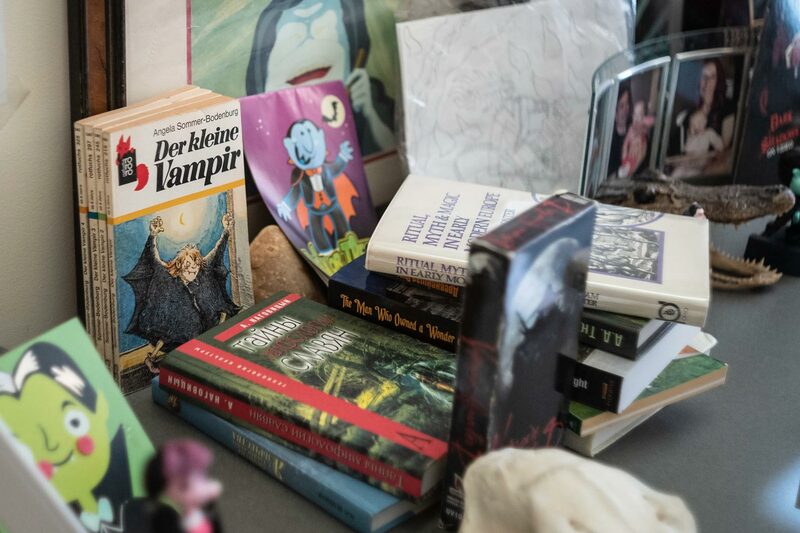 Stepanic will headline a free online “Digital Book Club” session with UVA’s Clubs program Tuesday at 8 p.m., leading a discussion of Anne Rice’s 1976 novel, “Interview with a Vampire,” that revived the vampire genre. Stepanic said if you’ve not read the book, watching the film will do just fine. Those interested can register here.